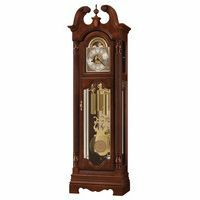 Hermle Brookfield Aberdeen grandfather clock features a handcrafted case made in Virginia, USA! The case is constructed of Aberdeen Oak. 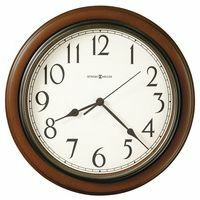 The Hermle movement and clock accessories are made in Germany. Assembled and Inspected in the USA! This finished cabinet has a tiered bonnet pediment with 3 raised, raised book-matched Cera Jera hand rubbed veneer panels on the crown.. This well balanced case feature half-turned reed columns, a tiered base with floor levelers, a lockable front door with beveled front and side glass. The dial has applied brass Arabic numerals, a moving moon disk and ornate cast center and corner spandrels. The pendulum bob has a matching cast center disk and the weight shells have a matching band. 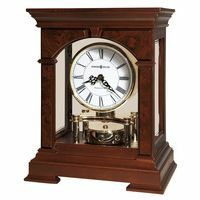 The mechanical 8 day cable driven movement offers the three most popular clock melodies, Westminster, St. Michael and Whittington, second hand feature and automatic night shut-off.